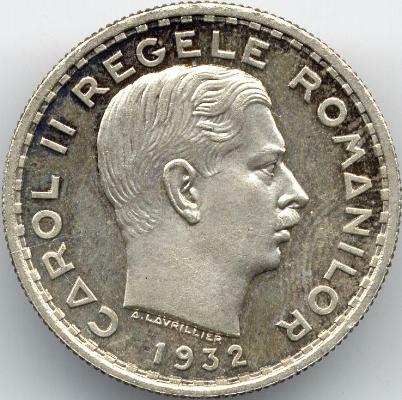 denomination "100 lei" and Romanian coat of arms inside laurel wreath inscription "CAROL II REGELE ROMANILOR" meaning "KING OF THE ROMANIANS", year 1932 and CAROL II head facing right. Under the neck lies A. LAVRILLIER, the engraver's name. 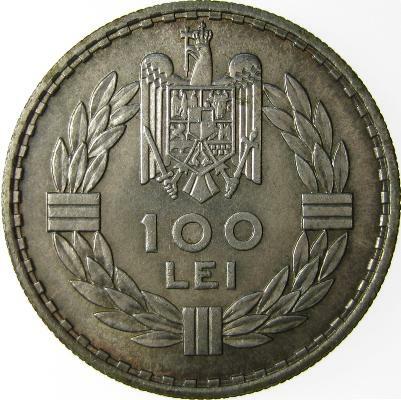 The 100 lei 1932 coins were minted abroad, in two mints. 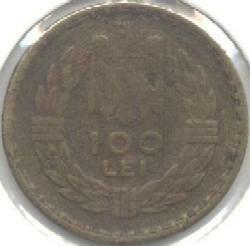 The common variant is struck at London (16.400.000 coins, the first image on this page) - or maybe 16.800.000 - value from Schäffer-Stambuliu catalog from 2009. The other variant - 2.000.000 coins - is struck at Paris, having a horn of plenty (mint sign) on the left and a wing on the right as distinctive signs. The wing marks the chief engraver of the Parisian Mint, Lucien Bazor. 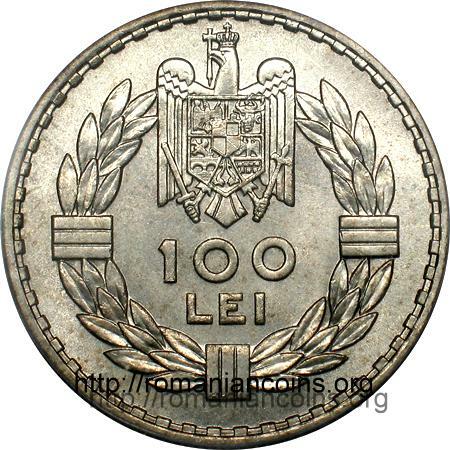 The images of the Parisian coin appears on Romanian coins through the kind permission of Mr. Andru C. Other pictures of a Parisian 100 lei 1932 coin appeared for a long time on Romanian coins through the kind permission of Mr. Adrian Popovici. 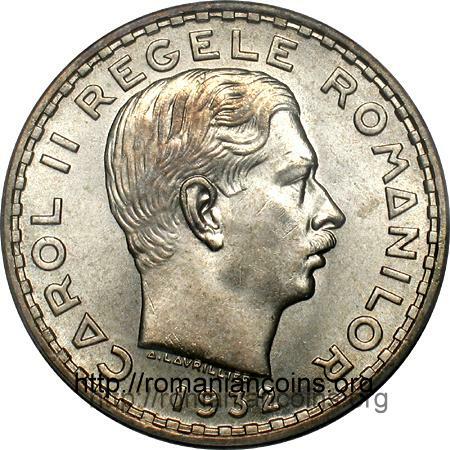 The pictures of the coin struck at London are present on Romanian coins through the kind permission of an anonymous donor. 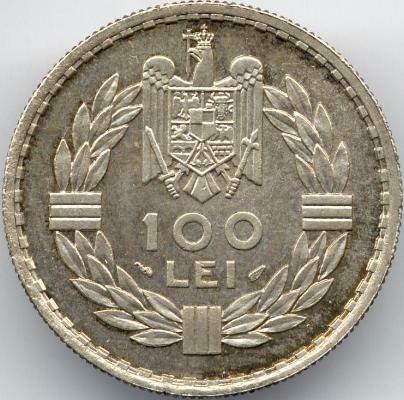 In Monede şi Bancnote Româneşti (Romanian Coins and Banknotes, 1977) it is mentioned that the coins without mint sign were struck at "Heaton, London". But the coins struck at Heaton were (usually) marked by an H, and Heaton Mint functioned always at Birmingham, never at London. In conclusion, the use of the Heaton Mint name in this case is an error. The coins without mint sign were struck at Royal Mint London. The information about the fact that the coins without mint sign were struck at London is present on the site through the contribution of Mr. Cristian Ciuplea. He also informed us that essays from Paris exist with the mint and engraver signs on the other coin face than the regular (business) strike. The images above picture a counterfeit weighing only 11.51 grams instead of 14, the weight of an original coin. 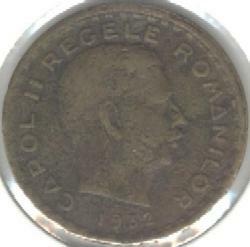 The pictures of the fake coin above were provided for Romanian coins by Mr. Moise Alexandru-Răzvan. Below are the pictures of a bronze fake, present on our site through the kind permission of Mr. Adrian Popovici. 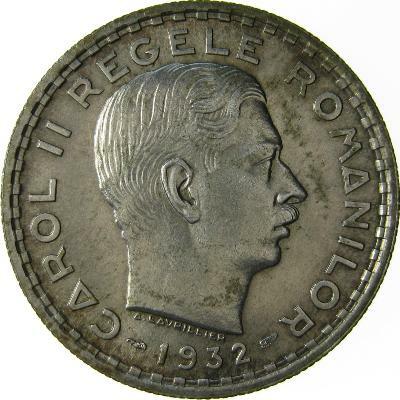 Above you can see a counterfeit coin (made of lead), present on Romanian coins through the kind permission of Mr. Áron Kovács.